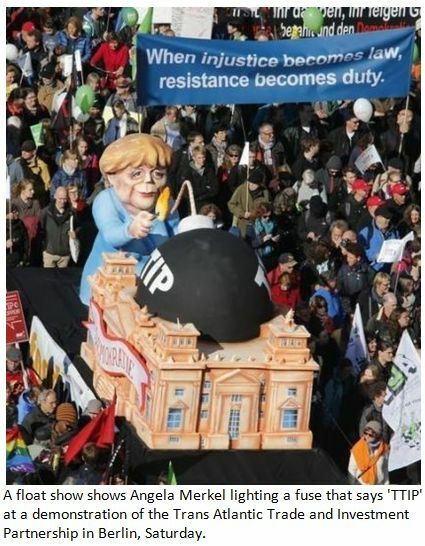 "According to Joachim Pfeiffer, economic policy spokesman for the Bundestag's Christian Democrats, all of the protesting against TTIP can be attributed to organized online gangs of 'click activists,' which are in no way legitimate. … To claim, like Pfeiffer does, that resistance is coming from loud 'misinformed people' makes the economic policy spokesman himself seem under informed. Because in addition to dozens of initiatives, legal and economic experts from Harvard, Yale, Columbia and Berkeley, led by Nobel Prize winner Joseph E. Stiglitz, have also been loudly and publicly opposing the agreement and its consequent privatization of the law." To motivate potential whistleblowers to leak classified Trans Atlantic Trade and Investment Partnership [TTIP] documents, about 3,000 people have donated over $100,000. TTIP is the multi-billion dollar trade agreement that the U.S. and E.U. have been bargaining over out of public view since 2012. It appears to cozy up to the larger enterprises: In addition to official negotiations, around 600 meetings with lobbyists and company representatives have been held, as has been revealed by research and freedom of information requests. WikiLeaks, which had called for the money to be collected, now promises the six-figure bounty to TTIP-informants. The fact that such a large amount of money was collected in just a few short weeks testifies to the growing interest in the secret talks. After all, this agreement involves not only rules on tariffs and commercial rights, investor protection and the much-discussed right of investors to sue states, but also consumer rights, food safety, environmental standards, copyright and data protection. Even controversial details like the use of hormone therapy in animal breeding and animal cloning are under discussion. The lead negotiators are Ignacio Garcia Bercero [for the E.U. - video, right] and Dan Mullaney [for the U.S.]. It is they who will have to clarify details like those just mentioned and any others that emerge before the European Parliament and European Council are ultimately asked to approve TTIP and implement it. When that will occur is unknown - except that it seems nearly impossible during the remainder of the Obama presidency. The approval of national parliaments in Europe is irrelevant as this will not interfere with the provisional application of the agreement. In addition to general criticism of free trade and the shadow legal system it envisions, the crux of the matter on both sides of the Atlantic is the lack of transparency of the talks. While there is a stack of papers labeled TTIP in special "reading rooms," access is limited to a few dozen members of the German government who have registered to read them. They may read for two hours and use "pen or pencil and paper" to take down some key points. Prohibited, however, are "mobile phones, cameras or recording equipment of any kind." TTIP negotiations appear to have entered the milieu of espionage. Whether and when this ludicrous analog permission to read has been made use of remains unclear. At a press conference this summer with members of the federal government, not a single German ministry could confirm that any of its members had in fact examined the aforesaid documents in those special reading rooms. Even employees of the Ministry of Economic Affairs involved in the matter could not provide an answer. They first needed time to investigate. Carta Maior, Brazil: Will Humanity Allow itself to be Excized Like a 'Cancer'? Financial Times Deutschland, Germany: Will Goldman Sachs Bring Facebook's Downfall? This fits the pattern, because what has been announced in the political arena on the matter of TTIP is a series of statements ranging from embarrassment to falsehood. 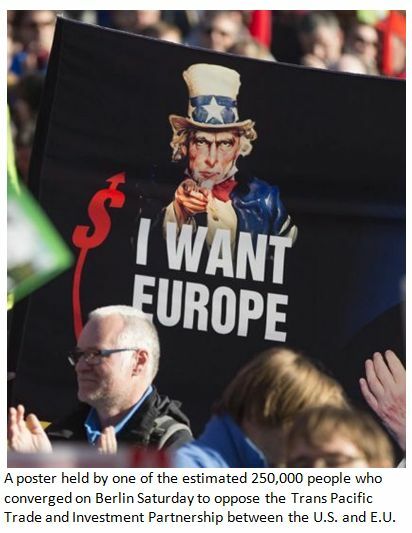 In the latter category, Bundestag President and leader of the Christian Democrats Norbert Lammert proclaimed loudly last year that, "a boost in annual growth of €119 billion ($135 billion) on the European side and €95 billion ($108 billion) on the American side" could be expected from the transatlantic trade deal. It was grotesque misinformation to use estimates of a decade of GDP growth to jazz up what he called "annual growth momentum." He was forced to retract. His party colleague Joachim Pfeiffer, economic policy spokesman for the Bundestag's Christian Democrats, is, like Lammert, not known as a critic of big business. During a heated Bundestag debate on October 1st, Pfeiffer called for arguments showing that TTIP is "the best free trade agreement we've ever had." He then launched into a tirade against the "outrage industry" which he suspects is behind the global campaign against TTIP. 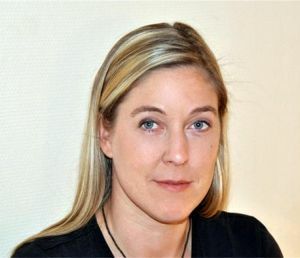 According to Pfeiffer, all of the protesting against TTIP can be attributed to organized online gangs of "click activists," which are in no way legitimate – and he said that no one has read the TTIP documents the government has made available. What Pfeiffer failed to point out is that: Even to have this handful of documents put online, the E.U. Commission's online consultation required the participation of 150,000 E.U. citizens. The documents that were then provided only convey the situation of the talks months ago and since May, there have been no updates. No one should be surprised at the protests that originate online, since that is precisely the place discussions today are held. But to claim, like Pfeiffer does, that resistance is coming from loud "misinformed people" makes the Christian Democratic economic policy spokesman himself seem under informed. Because in addition to dozens of initiatives, legal and economic experts from Harvard, Yale, Columbia and Berkeley, led by Nobel Prize winner Joseph E. Stiglitz [video, right], have also been loudly and publicly opposing the agreement and its consequent privatization of the law. Even the competent rapporteur of the European Parliament has joined the protests, opposes the [supra-national] arbitration it proposes, and can hardly be accused of being "uninformed." This week things will likely bring a showdown, as a mass demonstration against TTIP is being held in Berlin on October 10th to bring demands for civil society to be involved out into the streets. One recalls the failure of the Anti-Counterfeiting Trade Agreement in 2012. And most certainly, the so-called "click activists" of the "outrage industry" will not be looking for small talk and finger food.